Today I’ll be commenting on one of my family’s favorite Disney restaurants, Mama Melrose’s Ristorante Italiano. Located in Hollywood Studios, it is positioned very near Muppet Vision 3D, another favorite of ours (post on that coming soon is right here!). As you’ve probably figured out from name, Mama Melrose is an Italian style restaurant. “Hollywood meets Italy” is its little gimmick. It is filled with memorabilia of movie stars long and other performers, along with other decorations calling to mind both California and Italy. It is a greet place take the family; also, it is a good idea to get reservations! As for the food, hardly anything in Disney can best it (maybe the juice at Ohana or the dessert at Be Our Guest Restaurant), but with Italian food one cannot go wrong here. Mama Melrose offers a Kid’s Menu, but more adventurous children, might want to try one of the various pasta or seafood dishes from the adult menu. I’ve honestly had nothing but positive experiences here as far as I can remember, whether I’ve gone for lunch or dinner (it doesn’t serve breakfast). 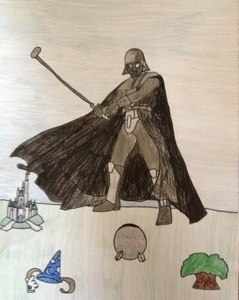 I drew Darth Vader using a tutorial on this website (let’s just say there was some outright tracing involved). Anyway, here’s the inside. 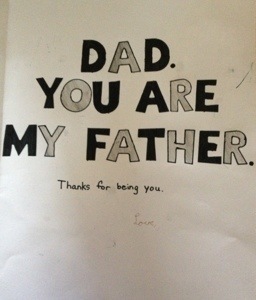 Happy Father’s Day from Pxzi!!! 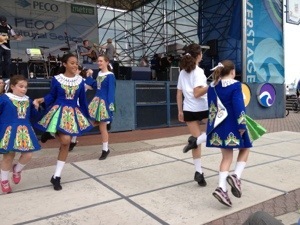 My family and I recently attended the annual Irish Festival in Philly. 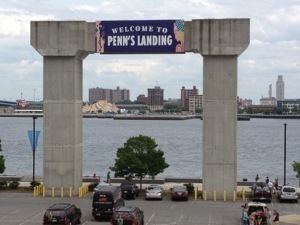 Held at Penn’s landing, it was tones of fun despite the somewhat rainy weather. 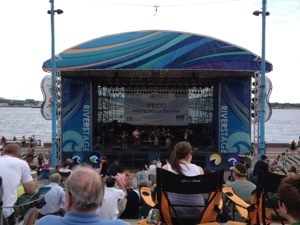 There was live music on a stage right near the water. I can’t remember the names of the bands, but they were mostly mixtures of Irish folk tunes and modern, contemporary music. People sat on the steps to listen. Everyone was wearing green and having a great time. 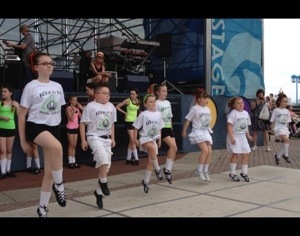 During the festival, different Irish Dance schools got a chance to show their skills in front of the crowd. It was rainy during the first performance, and as I didn’t want to endanger my camera, I didn’t get any pictures of them. However, the sun shined on the next group and I got some great pictures! My sister Rosie is in this group. She’s the one in sneakers, floating off the ground! These girls were nothing short of amazing and I wish I had a video because the pictures just can’t show the actual movement. 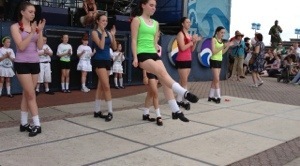 They had fancy shoes on that made a noise like tap shoes (another reason I should have taken a video) and danced perfectly to the Irish music playing in the background. These girls’ outfits are so pretty- I’m just glad it wasn’t too hot out. This little boy is pretty darn inspiring. 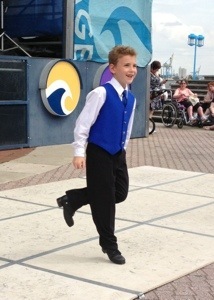 He wasn’t the only boy dancing, but he was the only one doing a solo. Pretty brave of him, I’d say, but he seems to be enjoying it- just look at that smile! 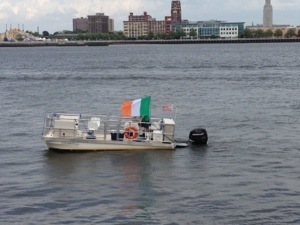 I’ll leave you with a picture of this boat cruising down the river- Irish Forever!